Applications are now being accepted for the 2019 season! 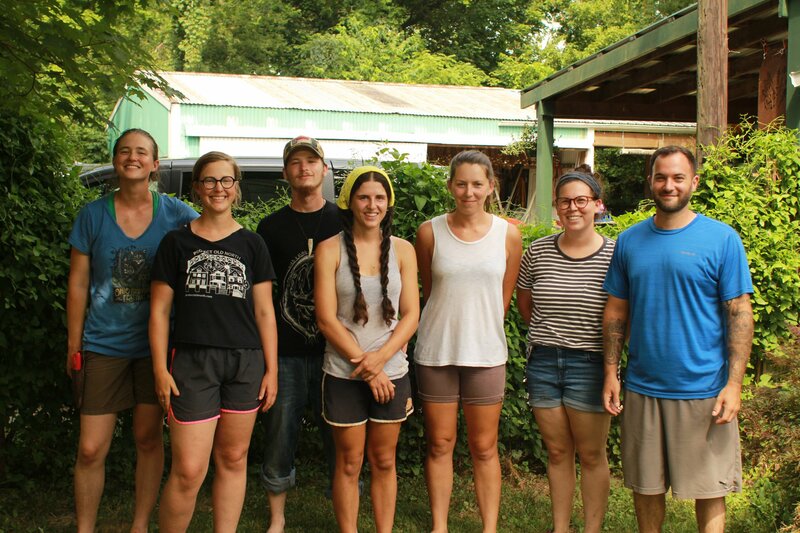 The Begin Farming Apprenticeship Program is an educational program for aspiring farmers to gain the hands-on experience and skills necessary to consider a career in organic agriculture. Ideal candidates will have a strong commitment and desire to start a farming operation of their own. Banzhaf Garten Organic Farm, in Ashland, Ohio is a 20 acre mixed vegetable and fruit farm and has been certified organic since 2003. Farmer Dave Benchoff primarily sells products through Local Roots in Ashland/Wooster and the Howe Meadow Farmers' Market. One bedroom, shared housing on-farm is available at this host farm. Jorgensen Farms, in Westerville, Ohio grows organic vegetables and herbs and operates a farm events and wedding venue. Farmer David Karikomi grows vegetables that are sold at various central Ohio farmers' markets and to the Jorgensen Farm's catering business for farm-to-table events. Mile Creek Farm, in New Lebanon, Ohio is a small family farm growing fresh produce for the local community. Mile Creek Farm has been in operation since 2007 and certified organic since 2010. Farmers Ben and Emily Jackle sell a wide range of vegetables through a CSA and through the 2nd Street Market in the Dayton. Mud Run Farm, in Navarre, Ohio is a small, organic farm which is the result of the dream and desire of owners Alex and Kathy Dragovich to raise their family on a farm. They wanted their kids to be able to run and explore. They also wanted to grow and raise their own food. Most of their friends and family told them that they were crazy. In the years since they have grown an array of vegetables, started an orchard, grown berries, raised chickens, goats, sheep, pigs, and milked cows. Some were a success, some were turned into cautionary tales. Alex has long campaigned on the importance of eating and growing organic food. He has spoken out against fracking and other environmental dangers that face all of us every day. Sunbeam Family Farm, nestled in the small town of Alexandria, Ohio, is a diverse 10-acre farm (including a greenhouse and 5 hoop houses), raising over 25 types of vegetables as well as strawberries and melons. Our mission is to build a connection between soil, grower, and community using organic practices. Farmers Chuck and Cynthia, along with their son Ben (crop specialist) raise produce for a 90-member CSA, attend farmers' markets in both Granville and Newark, and deliver to Denison University and the Columbus area. All people working with and for Sunbeam are well-trained, included in all day-to-day operations, and given responsibilities that engage their minds not just their hands. That Guy's Family Farm, in Clarksville, Ohio is a 48 acre diversified family farm located on the banks of Todds Fork. Farmers Guy and Sandy Ashmore have been certified since 1998 and sell produce to the Deerfield Farmers' Market and operate a summer and winter CSA. On-farm apprentice housing for two individuals is available at this host farm. Apprentices will gain on-farm experience in the daily production practices of a mixed vegetable operation as employees of the host farms. Apprentices may have the opportunity to be immersed in farm business management, including organic certification requirements and marketing. Apprentices will work with the Begin Farming Program Coordinator and their host farms to develop a personal learning plan tailored to their training needs and host farm offerings. By the end of the apprenticeship, participants will have experienced multiple hands-on practices of one farm's operation, gained insight into some of the challenges to have a successful farm business, and have a better idea of whether they want to go into farming. In addition to this paid position, apprentices will attend distance education workshops, tour diverse farms, and connect with other apprentices and host farms through skill-share and networking opportunities within the community. Apprentices will also receive a scholarship to attend the Farm Vision workshop to help clarify their motivation, vision, strengths, and training needs to begin their own operation. Work mainly outside and occasionally indoors, often doing monotonous and physical activities. Work closely with a small team every day and contribute as a team member. Maintain high work quality standards even when working independently. Learn a tremendous amount about yourself, your strengths and weaknesses, how a certified organic mixed vegetable operation works, and if agriculture is really for you. A positive “can do” attitude! Apprentices will be paid $10/hour, receive an individually-tailored learning plan, and networking and educational opportunities with others in the program. What do you, the apprentice, want to learn from this experience? Consider making a detailed list of the skills and experiences you want to acquire. Also, consider your farming philosophy, and learn more about the host farms from their websites to see if you will be a good match. You will be working closely with your host farmer(s), and developing a strong, working relationship will be essential to a fulfilling, positive experience. This program is geared towards organic vegetable production, so if you are seeking an experience on a multi-species livestock operation, this may not be the best fit for you. Why are you interested in pursuing farming as a livelihood? What are the aspirations you have dreamed about, if any, for a future farm of your own? What challenges do you perceive to farming and how would you plan to address those challenges as a farmer? What do you hope to learn from this apprenticeship and why is it important to you? Applications are now open for the 2019 season! Please direct all questions to Rachel Tayse, Begin Farming Program Coordinator.